Home / MLB Debut / Happy Lucas Giolito Day! We had to wait to see if this game was going to get underway to get this post up and make it official. Today is Lucas Giolito’s much-anticipated MLB debut. He just struck out his first batter in Major League Baseball. He’s going to be a good one folks. Scouting: As Jeffrey Paternostro noted in a recent piece, in the four seasons we’ve been posting Eyewitness Reports from the prospect team, exactly five live reports have been filed at an 80 OFP, and all five were on Lucas Giolito. This accurately reflects his upside, and with the midseason recall of a tall righty with a prototypical pitching frame, clean mechanics, and an array of potentially dominant pitches, it’s hard not to be reminded of the arrival of aces like Strasburg and Noah Syndergaard. 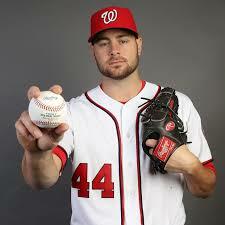 Pitching from a high-three-quarters arm slot, Giolito will mix in both a four-seam and two-seam fastball. His velocity has recently sat anywhere from 91 to 97, and he’s topped out as high as 98 to 100 in the past. As impressive as those velocity figures are on their own, the fastball plays better than the raw velocity because of incredible downward plane that’s noted by nearly everyone who has seen him. When needed, Giolito will cut his four-seamer and run his two-seamer; altogether, the fastball is far from a lifeless pitch showing just one look, which will serve him well at the major league level. His curveball has the single highest ceiling of any pitch thrown by a current pitching prospect—all five of those Eyewitness Reports referenced above graded it as a future 80 pitch, and I concur in that upside judgment. It’s got the potential to be the type of beautiful and dominating out-pitch that gives hitters quite a lot of trouble, but it was less consistent than that in recent viewings by Craig Goldstein and Adam McInturff. The changeup is a work-in-progress, but already flashes as a passable major-league third offering. He’ll need to rely on it more to get major-league hitters out multiple times through the order. It’s not totally roses, twin pitches potentially peaking at an 80 grade, and comps to aces, though. Giolito’s command has always been a bit worse than you would hope for given his stuff and overall polish. Shaky command is the most common negative on a top pitching prospect and can definitely be overcome—for example, Syndergaard’s command concerns were more significant than Giolito’s, and have completely dissipated in the majors. But if there’s a skill-related factor that limits Giolito from reaching his top-of-the-rotation upside, command is probably going to be it. After reports emerged early this year that Giolito didn’t look right, sitting towards the lower band of his velocity range with diminished effectiveness, ESPN’s Keith Law noted that the Nationals had made some mechanical changes that have since been reversed. Between that and the managerial hire of Dusty Baker, there’s an easy joke to be made about the Nationals screwing up a sure thing—whither Mark Prior—though Baker’s days as an accused young arm shredder are long since in the past. Since joining the Nationals’ system, Giolito’s workload has been handled with extreme care. He was limited to 98 innings in 2014 between skipped starts, low pitch counts, and a healthy shutdown in August. In 2015, Washington held a healthy Giolito back in extended spring training until May, and while he pitched on a regular schedule with loosened pitch counts, he only totaled 117 innings on the season. The Nationals are strong believers in innings limits, famously shutting a healthy Strasburg down in 2012 on the doorstep of the playoffs. It’s hard to see Giolito going much over 150 innings this year—he’s already thrown 71 in the minors—so even if he performs to his potential immediately, he may end up in the bullpen or inactive later in the season, playoff hunt or not. And despite his prototypical build and delivery, there’s always going to be a durability red flag on a Tommy John survivor who hasn’t approximated a major-league starting workload over the course of a full season yet. A special thanks to Stephen Strasburg for making this all a possibility with yet another DL stint. Giolito could be up for good, and a lot of fun to watch going forward.